Here's the third book on Gustav Klimt's life and career of paintings, this time in a small, more portable handcover format. The first two books that were also published by publisher Taschen were the XL and XXL editions. I saw one of those gigantic editions in the library once and lifting them off the shelf was a challenge itself. So it's good that Taschen has now created a smaller edition for those who don't need something that huge or those who simply don't have the shelf space. This new book is also significantly cheaper, selling at around US $20. The author of the book(s) is Tobias G. Natter. I'm not sure if the content in the three editions are similar. XL has 604 pages. XXL has 676 pages. This small edition has 672 pages. This is the book to get if you want to know everything there is about Gustav Klimt, his life, his career and his paintings. There's a lot to read and see. 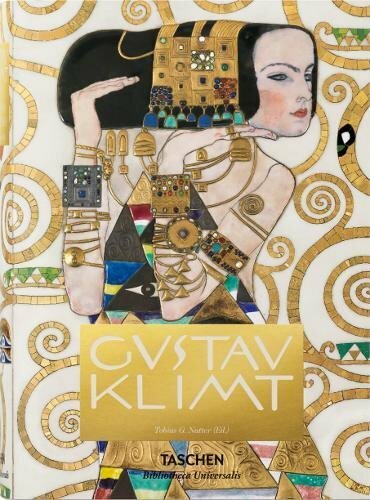 This books looks in detail at the growth of Gustav Klimt through his lifetime of art. The paintings are wonderful. There are also sketches and photographs of Klimt and the subjects he painted. Having this new and smaller edition is a great move. This book is now made more accessible to everyone because of the smaller size and affordable price. Should you want to look at the artworks large, you have the option too with the XL and XXL editions.